(Quick)If I remember correctly, your guild is 500+ strong between UO and EQ. How do keep things under control with numbers that large? (Dragons) Well, if I said it was easy, Id be lying. There are days its real tough and days when the guild almost runs itself. The reason we are so large, yet so unified and so successful and so old, is that we have a very good core set of values. We recruit ONLY people that share those values. Our motto is "Quality not quantity" but the interesting side affect of that is that if you recruit quality and offer those people something of great value they will bring in more quality players and that gives you quantity. (Quick)This was truly a great interview with a very nice guy. I give him much credit for the hard work he puts in every day for his guild. Anyone giving any thought to joining this guild should give it a try, you won't be unsatisfied. What kind of memberbase do you aim torwards? OGGs differentiate themselves from standard guilds by covering more than one game, typically their members will play a number of online games and will sometimes move wholesale into the latest online world. What do these groups offer the gamer and are they anything more than a loose amalgamation of MUDites seeking friendship on the Internet? The unifying theme with all OGGs is that they offer the "lone gamer" a community to belong to. Whilst in-game guilds exist to service a generally short lived population (most guilds only last for around 6 months or so) OGGs tend to last for years. All of the Groups in my "survey" have been in existence for at least 2 years. If I was forced to say which one is the "leading light" it would have to be "The Syndicate", because it is closest to my ideal "model" for an OGG. Q: I have personally met Dragoon and HUCK, both of The Syndicate. Both seemed to be very nice fellows, and one even provided my thief with a recall scroll (his magery is abysmally low). However, I really haven't dealt with many of LLTS's members. Perhaps you could shead some light onto the matter, by telling me of a few of the more notable occurances, within the guild, in which LLTS reached out to help fellow players? A: Yes, both of those are good examples of the quality members we have. But it doesnt stop there. We have a whole guild like that :) To answer your question though, we do a TON of events for fellow players. 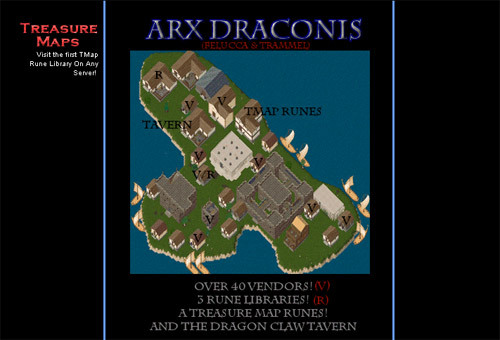 We run the oldest player run town known as Arx Draconis. We call it "AD" for short. What AD does is serve as a focal point and spring board for a great many events and things we do for players. Some examples include Scavenger Hunts, Lotteries, Quests, Magic Resistance Training Sessions, PvP Contests, Craftsman Nights and various Tavern Games. There are 1-3 events on AD EVERY week that are completely open to the public and FREE :) We even provide gates from the major banks and then back to town so that newer players can participate. During those events, we do not engage those guilds that are orange to our warstone either (unless they chose to attack us, as some do). Its a free event, open to the public and fun for all :) We try not to exclude anyone. Now before anyone gets all wound up, I'll be straight forward, I have only heard of one of the guilds mentioned. That being "The Syndicate". The Syndicate is very active in EQ and UO (or was). What the guild is now, compared to their entrance into UO, is a testament of persistence and growing. Now their yells of, "LLTS!" are common place in EQ and are no longer met by scorn or dislike. The Syndicate has indeed grown into and well earned the reputation as one of the premier guilds on line. This is fact and can never be refuted by anyone with any knowledge or time spent on line.